The execution of both strokes begins in a similar manner, but the final few movements are different. Keep three things in mind when you play these strokes. A. Always get inside the line of the short ball. B. If you want to hit the ball along the ground, ensure that you roll your wrists at the point of impact. C. Remember that the pace of the ball might force you to 'hurry up', thereby increasing the chances of your making a mistake. Hence, attempt these strokes only after you have practised them and feel reasonably confident of executing them well. 1(A) Raise the bat straight behind you, keeping your knees and elbows flexed. When facing fast bowlers, lift the bat a little earlier than usual. (B) Keep your head still and focus on the ball. 2(A) Move the right foot backwards (for 'righties') and across the line of the ball, so that your head is inside the line of the ball and the body is facing the bowler. (B) Start stretching your arms outwards at full length as you swing the bat across the path of the ball. (C) Transfer your weight onto the back foot. 3. Swing the bat horizontally across the path of the ball with the arms fully extended. Your body should rotate, pivoting on the right foot. A hook can either be played high in the air, or along the ground. 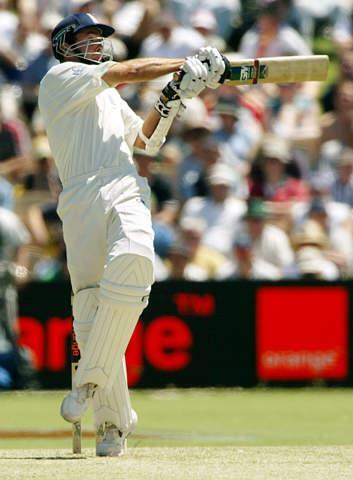 To keep the ball on the ground, the batsman should roll his wrists at the point of impact. A word of caution - Be prepared to duck if you do not hit the ball. The hook can be a risky shot. You can get a top-edge and give a catch on in the fine-leg / long-leg region, or you can even get hit on the upper part of the body if you miss it. Some batsmen have managed to play the ball onto their face or head and sustain serious injuries! The pull is easier to play than the hook. As in the hook, the bat is swung horizontally across the path of the ball with the arms extended and the right foot acting as a pivot. Your body should not rotate as much as it does while playing the hook. The ball is 'pulled' squarely along the ground or over the infield, on the leg side. Normally, the pull is played in front of square. At the end of the shot, the body-weight is transferred onto the left foot. At the completion of the pull shot, the body-weight should be transferred onto the right leg (for right-handers) in the follow-through. Among the great pullers in today's times are Ricky Ponting, Sachin Tendulkar and Rahul Dravid. Sir Don Bradman. The 'best of them all', was a master of this stroke. He must have scored nearly 40% of his first-class runs with the pull! The main difference between the pull and the hook is that a pull is generally played off a delivery that is chest-high or even slightly lower, whereas the hook is played to a ball above shoulder-height. While executing the pull, your footwork should get you across the line of the delivery, while on the other hand, you need to be just inside the line or within the line of the delivery while playing the hook. 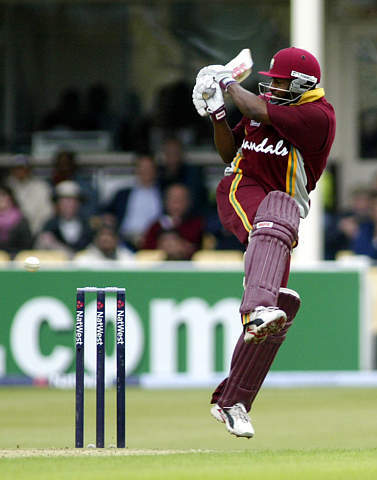 The range of the pull is between mid-on and square-leg, whilst the range of the hook is between square-leg and fine-leg.